Beaver were once abundant throughout North America but they were trapped nearly to extinction by the end of the 19th century. A keystone species, the loss of beaver to our watersheds has been incalculable . . . streams that once had water in them all year round now run dry. Waters that once meandered slowly across the landscape began to cut down into stream banks once held together by riparian vegetation like willows, cottonwoods, and aspens. In the 1950s, the Army Corps of Engineers set out to remove what beaver remained and straighten stream channels to bring water down to multi-million dollar reservoirs more quickly. Now those reservoirs are filling with silt, and increasingly there is not even enough water to fill them, leaving farms and cities to fight over dwindling water supplies. Climate change promises to make these problems even worse. Higher temperatures and reduced winter snow pack coupled with increased forest fires promise to deliver unprecedented drought. 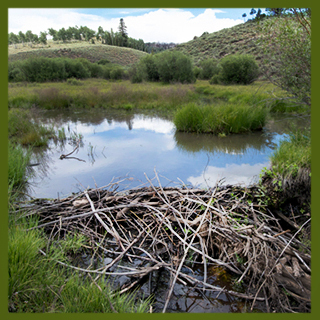 Restoring beaver to watersheds across the American West has the potential to radically improve the ecological capacity of these watersheds, even amidst the stress of climate change. That’s right: even in the hotter and drier West that’s coming, we can have more of what we need and value. But we can’t get there by treating our rivers and streams like drainage ditches; we will have to fundamentally re-conceptualize how we see and think about our watersheds. Our Beaver Believers are encouraging us to think about a new paradigm for managing our watersheds, to work with nature instead of against it, as we have done since the opening of the frontier. Perhaps nature’s most industrious and inventive critter, beaver are truly remarkable – their dams can very quickly transform parched and degraded watersheds into lush, wet meadows that act as sponges by holding water, reducing flood velocity, trapping sediment, raising the water table, keeping the water cool, and releasing it slowly throughout the year when and where it is needed most. In this film we follow our Beaver Believers out into some truly spectacular landscapes of the interior West, from the east slopes of the Cascade mountains in Washington to the Rockies in Colorado, from the parched red rock deserts of southern Utah to an urban park in central California. We take you to places where beaver have already begun to transform damaged watersheds, and we learn of the many challenges that stand in the way of larger scale efforts to use beaver as a restoration tool, including trapping, which is tragically still legal in most states. Perhaps most importantly, we meet incredible people who, undaunted by climate change, are working tirelessly to protect and restore beaver out on the landscape, who embody the spirit and joy that comes from "thinking like a beaver," who show us that collaboration and watershed restoration truly are possible. All we have to do is let the beaver come home.